Citation: C N Trueman "The Great Leap Forward"
The Great Leap Forward took place in 1958. The Great Leap Forward was Mao’s attempt to moderniseChina’s economy so that by 1988, China would have an economy that rivalled America. Mao had toured China and concluded that the Chinese people were capable of anything and the two primary tasks that he felt they should target was industry and agriculture. Mao announced a second Five Year Plan to last from 1958 to 1963. This plan was called the Great Leap Forward. The Great Leap Forward planned to develop agriculture and industry. Mao believed that both had to grow to allow the other to grow. Industry could only prosper if the work force was well fed, while the agricultural workers needed industry to produce the modern tools needed for modernisation. To allow for this, China was reformed into a series of communes. The geographical size of a commune varied but most contained about 5000 families. People in a commune gave up their ownership of tools, animals etc so that everything was owned by the commune. People now worked for the commune and not for themselves. The life of an individual was controlled by the commune. Schools and nurseries were provided by the communes so that all adults could work. Health care was provided and the elderly were moved into “houses of happiness” so that they could be looked after and also so that families could work and not have to worry about leaving their elderly relatives at home. The commune provided all that was needed – including entertainment. Soldiers worked alongside people. The population in a commune was sub-divided. Twelve families formed a work team. Twelve work terms formed a brigade. Each sub-division was given specific work to do. Party members oversaw the work of a commune to ensure that decisions followed the correct party line. By the end of 1958, 700 million people had been placed into 26,578 communes. The speed with which this was achieved was astounding. However, the government did all that it could to whip up enthusiasm for the communes. Propaganda was everywhere – including in the fields where the workers could listen to political speeches as they worked as the communes provided public address systems. Everybody involved in communes was urged not only to meet set targets but to beat them. If the communes lacked machinery, the workers used their bare hands. Major constructions were built in record time – though the quality of some was dubious. The Great Leap Forward also encouraged communes to set up “back-yard” production plants. The most famous were 600,000backyard furnaces which produced steel for the communes. When all of these furnaces were working, they added a considerable amount of steel to China’s annual total – 11 million tonnes. The figures for steel, coal, chemicals, timber, cement etc all showed huge rises though the figures started at in 1958 were low. Grain and cotton production also showed major increases in production. Mao had introduced the Great Leap Forward with the phrase “it is possible to accomplish any task whatsoever.” By the end of 1958, it seemed as if his claim was true. However, in 1959, things started to go wrong. Political decisions/beliefs took precedence over commonsense and communes faced the task of doing things which they were incapable of achieving. Party officials would order the impossible and commune leaders, who knew what their commune was capable of doing or not, could be charged with being a “bourgeois reactionary” if he complained. Such a charge would lead to prison. Quickly produced farm machinery produced in factories fell to pieces when used. Many thousands of workers were injured after working long hours and falling asleep at their jobs. Steel produced by the backyard furnaces was frequently too weak to be of any use and could not be used in construction – it’s original purpose. Buildings constructed by this substandard steel did not last long. Also the backyard production method had taken many workers away from their fields – so desperately needed food was not being harvested. Ironically, one of the key factors in food production in China was the weather and 1958 had particularly good weather for growing food. Party leaders claimed that the harvest for 1958 was a record 260 million tons – which was not true. The excellent growing weather of 1958 was followed by a very poor growing year in 1959. Some parts of China were hit by floods. In other growing areas, drought was a major problem. 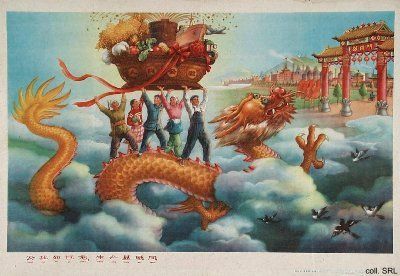 The harvest for 1959 was 170 million tons of grain – well below what China needed at the most basic level. In parts of China, starvation occurred. 1960 had even worse weather than 1959. The harvest of 1960 was 144 million tons. 9 million people are thought to have starved to death in 1960 alone; many millions were left desperately ill as a result of a lack of food. The government had to introduce rationing. This put people on the most minimal of food and between 1959 and 1962, it is thought that 20 million people died of starvation or diseases related to starvation. The backyard furnaces also used too much coal and China’s rail system, which depended on coal driven trains, suffered accordingly. By 1959, it was obvious that the Great Leap Forward had been a failure and even Mao admitted this. He called on the Communist Party to take him to task over his failures but also asked his own party members to look at themselves and their performance. Some party members put the blame of the failure of the Great Leap Forward on Mao. He was popular with the people but he still had to resign from his position as Head of State (though he remained in the powerful Party Chairman position). The day-to-day running of China was left to three moderates: Liu Shaoqi, Zhou Enlai and Deng Xiaoping. In late 1960, they abandoned the Great Leap Forward. Private ownership of land was reinstated and communes were cut down to a manageable size. Peasants also had the incentive to produce as much spare food as was possible as they could sell any spare that they had a market. These three moderates had restricted Mao’s power but his standing among the ordinary Chinese people was still high as he was seen as the leader of the revolution. He was to use this popularity with the people to resurrect his authority at the expense of the moderates. This was in the so-called Cultural Revolution.